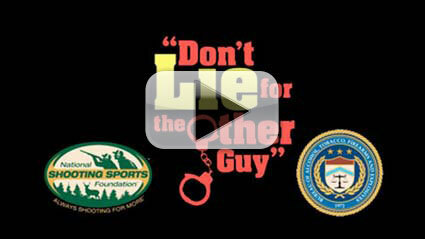 What is the Don't Lie for the Other Guy campaign? A campaign led by the Bureau of Alcohol, Tobacco, Firearms and Explosives (ATF), the National Shooting Sports Foundation (NSSF) to help ATF to better educate America's firearms retailers on how to detect would-be straw purchasers and to raise public awareness that it is a serious crime to buy a firearm for a prohibited person or for someone who does not otherwise want his or her name associated with the transaction. The campaign was developed by NSSF and ATF in 2000 and has been active in cities around the country. The ATF identifies key cities in which to launch the Don't Lie campaign. Firearms retailers in and around the city will receive enhanced training materials on identifying straw purchasers. NSSF leads a public awareness campaign to educate members of the community on what a straw purchase is and the severe penalties associated with attempting such an illegal buy. A straw purchase is an illegal firearm purchase where the actual buyer of the gun, being unable to pass the required federal background check or desiring to not have his or her name associated with the transaction, uses a proxy buyer who can pass the required background check to purchase the firearm for him/her. It is highly illegal and punishable by a $250,000 fine and 10 years in prison. What percentage of criminals obtain their firearms from friends or family or the street? According to the Bureau of Justice Statistics, 40 percent of criminals obtain their firearms from friends or family and another 40 percent obtain their firearms from illegal sources on the street. Can the firearms criminals purchase illegally on the street come from straw purchases? According to the ATF, the average "time to recovery" (the time span between the initial purchase of a firearm to the time that it is used in a crime) is more than 11 years. This tells us that criminals typically are using older, recycled firearms, not newer firearms recently purchased from licensed retailers. So, unless you believe that criminals are buying firearms only to use them a decade after the purchase, it is clear that straw purchasing is not a common method for criminals to obtain guns. If few criminals obtain their firearms via straw purchasing, why does the firearms industry spend so much time and money on the Don't Lie program? The firearms industry takes very seriously the criminal acquisition and misuse of its products. While there is nothing the industry can do to stop a criminal from stealing a firearm or buying one on the street illegally, the industry can make sure that firearms retailers are better prepared to recognize and stop any would-be straw purchaser. Even if the number of criminals who illegally obtain their firearms through straw purchasing is very low, through awareness programs such as Don't Lie, that number could fall even more. Should firearms retailers be held responsible for straw purchases? No. A straw purchase is when someone who is able to pass the FBI-NICS background check lies to the firearms retailer about who the gun is for. Unless the straw man somehow tips the firearms retailer off, in which case the retailer would refuse the sale and contact the ATF, there is simply no way for the retailer to know that the purchaser is lying. This is why law enforcement calls it an illegal straw purchase and not an illegal sale. 1. What is a Federal Firearms Licensed Retailer? A Federal Firearms License, or FFL, is a license that enables an individual or a company to engage in a business pertaining to the manufacture of firearms and ammunition, and the interstate and intrastate sale of firearms. It has been a legal requirement since the enactment of the Gun Control Act of 1968. 2. Who is a "Prohibited Person?" Unlawful users of certain depressant, narcotic or stimulant drugs. Those adjudicated as mental defectives or incompetents, or those committed to any mental institution. Persons who have renounced their citizenship. Persons subject to a court order that restrains such persons from harassing, stalking or threatening an intimate partner. Persons under indictment for a crime punishable by imprisonment for more than one year are ineligible to receive, transport or ship any firearm or ammunition. 3. What is the process of buying a gun? Before a licensed firearms retailer can sell a firearm, the purchaser must complete, under penalty of perjury, a Firearms Transaction Record (Form 4473). Once the form is completed, and before any firearm is transferred, the purchaser must pass a mandatory background check through the National Instant Criminal Background Check System (NICS), which is run by the FBI. Once the purchaser passes the background check establishing that he/she is not a prohibited person, the firearm may be transferred. In some states the state police conduct the background check. Federal law requires a licensed retailer to report (Form 3310.4) multiple sales of handguns (more than one handgun to the same purchaser within a five-day period) to ATF and local law enforcement by the close of business. Federal law prohibits the sale of handguns across state lines. For example, a New York resident cannot purchase a handgun in New Jersey. 4. Are most firearms retailers legitimate, law-abiding businessmen and -women? According to the Department of Justice (DOJ), the DOJ Bureau of Justice Statistics and ATF, the overwhelming majority of FFLs—99 percent—are law-abiding, hard working, taxpaying businessmen and women. Criminals rarely obtain the firearms they use in crime from licensed retailers (less than 8.5 percent) and it is important to note that those few criminals who do acquire firearms via licensed retailers do so by passing an FBI background check, perjuring themselves on a government form (another crime punishable by prison time and steep fines) and by lying to the firearms retailer. In 2011, ATF moved to revoke only 0.1 percent of all licenses. And, a single violation, even if not intentional, of any provision of the Gun Control Act or the ATF regulations is all that is needed for ATF to revoke a retailer's license. 5. What kind of relationship does the firearms industry have with law enforcement? The firearms industry has exceptionally strong and longstanding relationships with law enforcement at the federal, state and local levels of government. On March 27, 2001, the City of Boston declared that, "The City acknowledges that the members of the industry and firearms trade associations are genuinely concerned with, and are committed to, the safe, legal and responsible sale and use of their product." The firearms industry and law enforcement participate in cooperative educational and awareness programs such as Don't Lie for the Other Guy and joint retailer education and compliance enhancement seminars. For decades NSSF has provided free booth space to ATF (and more recently FBI - NICS) at its annual industry trade show (SHOT Show) where ATF and NICS interface with thousands of licensed retailers. In addition, every year at the SHOT Show NSSF runs a series of retailer educational seminars with ATF and NICS. The firearms industry meets frequently with ATF and FBI-NICS officials to discuss the myriad issues surrounding firearms regulations, legislation, freedom and responsibility.